How Many Stocks Should I Own as a Dividend Investor? 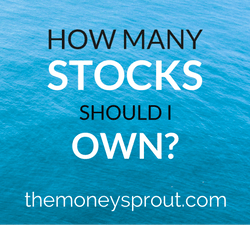 As an investor, have you ever asked yourself the following question – “How many stocks should I own? I know that I have asked this same question over and over through the years. In fact, I still ask that question today. There really is no correct answer. 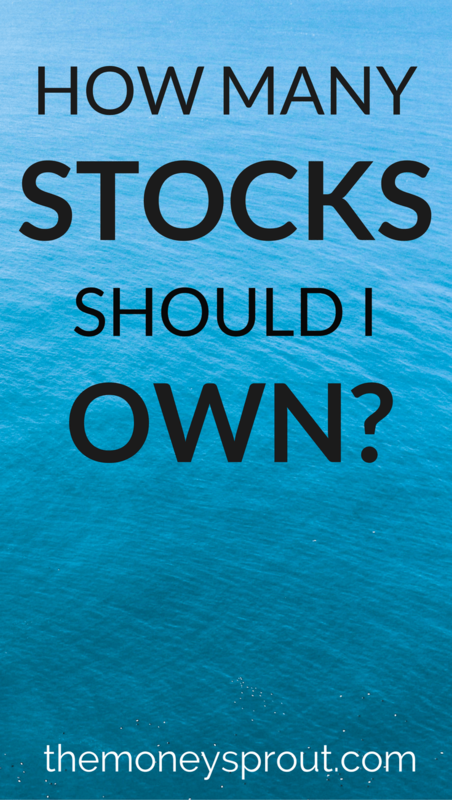 The number of stocks you “should” own would likely differ based on your investment goals. For example, my goals as a dividend investor are much different than a day trader or value investor. And even though there is no magic number of stocks I should own as a dividend growth investor, I know that my portfolio must be as diversified as possible. Whether that means I should own 10 stocks, 50 stocks, or even 100 … that is debatable. But what isn’t debatable is that owning just a few dividend stocks can be very risky. So what number of stocks is ideal for a dividend income portfolio? I think that all depends on the stage you are at as a dividend growth investor. Here are 3 different stages you will likely come across as a dividend growth investor. Each stage has an estimated number of stocks you can try and shoot for. Unless you have unlimited funds to invest, a new dividend investor won’t be able to diversify across too many companies. Starting out, my suggestion would be to try and diversify across 6 to 10 different dividend paying stocks. This may seem like a daunting task at first, but if you can keep your costs low and use brokers like Robinhood and Stockpile … you should be able to invest a couple hundred dollars at a time. Both brokers make it possible to invest small chunks of money each month without paying a ton of commissions and fee’s. You could also look to setup a direct stock purchase plan (DSPP) through a company. Just be careful, as some charge investment fee’s while others do not. We built up good size positions in 5 different companies this way – Cincinnati Financial (CINF), ExxonMobil (XOM), Verizon Wireless (VZ), Clorox (CLX), and Lockheed Martin (LMT). It is also a good idea to try and invest across a couple different sectors. You don’t have to pick a stock in each of the 10 different sectors, but try and tackle a few. Some sectors are not very good for finding dividend paying stocks. For example, we only own 1 stock from the Energy Sector (ExxonMobil XOM) and 1 from the Utilities Sector (Consolidated Edison ED). And we don’t own any stocks from the Materials Sector. On the other hand, we own 5 companies in both the Consumer Staples and Consumer Discretionary sectors. When you are just starting out … make sure to diversify across different types of dividend stocks as well … not just the sector. For example, there are the traditional (and often boring) blue chip companies that yield around 2.5% to 3.0%. Companies like Johnson & Johnson (JNJ) and McDonald’s (MCD) would fall into this category. These stocks offer a modest yield and generally have a dividend growth rate around 5% to 7%. Make these stocks your foundation. Then there are your low yield but high growth companies like Apple (AAPL) and Lowe’s (LOW). These types of companies usually have yields well below 2.5% but have dividend growth rates in the double digits. Lowe’s just gave us a 17% raise a few weeks ago! Finally, there are companies that have a high current yield (3.5% and up), but are slower growing. Verizon Wireless (VZ) comes to mind in this category. This is the stage that I consider our dividend income portfolio to be in. We bought our first dividend stock almost 10 years ago and have been actively building our portfolio for the past 6 years. We are actively adding new capital to our portfolio and are reinvesting every dividend received back into more stocks. At this stage, I would estimate you should try and own 30 to 40 dividend stocks. Now that you have had time to build your foundation up, you can look to really start to diversify your portfolio. We currently (as of June 2017) own 28 different stocks in The Money Sprout Index … down from 32 earlier in the year. We had sold off very small positions in 4 different companies (K, KHC, DPS, and VFC) a few months ago due to the LOYAL3 closing. Looking back, it may have been wise to hold onto these 4 companies as none of them cut their dividend. We sold our shares because of logistics in transferring them from LOYAL3 to our Fidelity account. Since we wouldn’t be actively investing $1,000+ or more in any of these companies, it didn’t seem wise to transfer them to Fidelity. So instead of keeping our shares, we sold them off and used the funds to buy partial shares of Apple (AAPL), Best Buy (BBY), and Target (TGT). Note – Our minimum investment amount at Fidelity is $1,000. We will only buy a stock if the fee’s are less than .5%. Based on a $4.95 commission at Fidelity, we would need to invest $990 to get under the commission threshold we have set for our portfolio. Within the next 2 to 3 years, I would anticipate that we will own shares of stock in about 40 – 50 different dividend companies. It really depends on if we have the investment tools available to keep costs down. Even though LOYAL3 has shut down, we still are actively building our portfolio using our Robinhood account. This broker does not charge any commissions or fee’s and is a great opportunity to grow your portfolio one month at a time. Another broker that we are just starting to explore is Stockpile. This company charges $0.99 per trade, but will allow you to invest in partial shares. In order to meet our .5% commission threshold, we would need to place orders for $198 or more. That is much more feasible than $990. One of the final stages, and the reason why we are building our portfolio, is when you can start living off your dividend income. Maybe your dividend income won’t cover all your expenses, but this is the stage where your portfolio is producing sustainable income month after month. At this point, I would say you should try and own 50+ dividend stocks. You have likely spent decades building your foundation and diversifying your portfolio. Your portfolio should be on auto-pilot at this point. Owning the same stocks for decade(s) allows your dividends to compound and compound and really start producing serious income. And by owning 50 or more stocks … you have limited risk and are able to sustain companies that are in trouble. If you are serious about living off dividends one day … then this is the goal you should be shooting for. As far as our portfolio, The Money Sprout Index, we have a goal of one day to own 100 dividend stocks! That may sound crazy, but over several decades I certainly think it is attainable. For a dividend investor, there is no magic number of stocks you should own. However, at a minimum you should probably own at least 10 and hopefully more depending on what stage you are at in building your portfolio. The more companies that you can invest in over several decades … the better diversified you will be. Of course, you want to make sure that you are only investing in the top dividend paying stocks. As you continue building the foundation of your portfolio and your income begins to compound, it may be wise to own 30 to 40 companies so you can be diversified. That way if one sector (think Financials back in late 2000’s) takes a hit, you are cushioned for the blow. And after decades and decades of investing and growing your portfolio, it is likely that you could own 50 or more dividend stocks. This is likely the point where you are not actively investing new money and are using dividends to actually help pay your bills. What stage are you in building your dividend stock portfolio? How many dividend stocks do you own? How many do you eventually want to own?